Rainford Hugh Perry was born in Kendal, a rural area, of central Jamaica, on 20 March 1936. He moved to Kingston, the capital, in his late teens and got a job selling records for Clement Coxsone Dodd's sound system; Dodd's was one of the first people to import records from to Southern States of the USA, where he had lived for a while. The R&B singles he sold were important in helping to shape the sound of modern reggae; just listen to Rosco Gordon's 'Booted', recorded at Memphis's Sun Records or 'No More Doggin'' and you'll immediately hear the direct link from Southern R & B to Reggae. The 'sound system' was to all intents and purposes a mobile disco and soon Perry was running one of the systems for Dodds but all too soon the import of American R&B records became less reliable and so Dodds founded his own record label that he based at his Studio One Hit Factory. By the time the early 1960s came along Perry had recorded around thirty songs for his bosses label. After a series of rows Perry left Dodds and went to work with Joe Gibbs at his Amalgamated Records. It was during this time that he was known as 'Little' Perry, as he is less than 5 feet (1.5m) tall, and before long this was adapted to 'Lee'. It would prove to be just one of many pseudonyms Perry has employed over his long career. In 1968, after falling out with Gibbs, Perry set up his own label; he called it Upsetter and his first single People Funny Boy, a sarcastic dig at his former boss, sold well in Jamaica and was one of the records that helped to define the early sound of reggae. 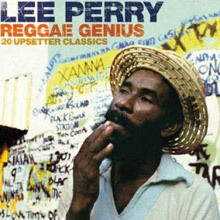 From 1968 until 1972 Perry worked with his studio band The Upsetters, who established a reputation as one of the best and most popular bands in the country. Perry's next big idea was to build a studio in the back yard of his house in Kingston. He called it Black Ark and was soon working with Bob Marley & the Wailers, The Heptones, and Max Romeo, among a large roster of some of Jamaica's best talent. One thing that Perry was able to do, having now got his own studio, was to create ever more lavish productions that helped to push the boundaries of Reggae. His mastery of what was far from sophisticated recording equipment is Perry's greatest achievement as a producer. 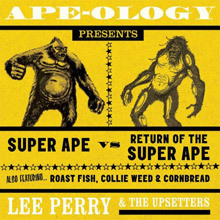 His album, Return of the Super Ape (Perry himself was Super Ape in one of his more creative personas) which came out in 1978 is the best example of his work from this period of his career. After five stressful, yet creative years at Black Ark it all came to end when the studio burned down in what were somewhat mysterious circumstances – Perry himself has even suggested he did it. From that time on Perry spent most of his time in America and Europe, performing and somewhat relying on past glories until in 1984 he recorded History, Mystery and Prophecy for Mango, which helped to get his career back on track. A year later he began recording with Mark Downie, who worked under the name of Marcus Downbeat, and the following year Perry released Battle Of Armagideon for Trojan. There is so much Lee 'Scratch' Perry material available that it is difficult to sort the good stuff from the decidedly average. Many of his earlier recordings were looted following not just the fire at Black Ark, but also in 1989 after King Tubby was murdered and his studio raided. Many of these recordings have found their way into the market in inferior pressings and some are of very dubious quality. For the man that has been labelled a genius as well as somewhat mad, it all means that it is best to stick to the Trojan, Island and Mango releases, where a strong sense of quality control has been exercised. 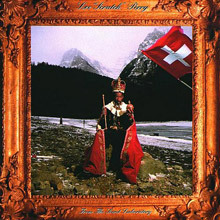 Perry himself still performs and records, often in collaborative ventures with younger artists from his home base of Switzerland where he has lived for over two decades. 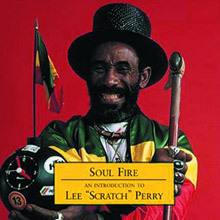 This was released in 1990 and like their first meeting (Time Boom X de Devil Dead), the second collaboration between Lee "Scratch" Perry and his acolyte, Adrian Sherwood, is a perfect mixture of Perry's manic toasting and singing and the sinuous beat supplied by the Sherwood-led Dub Syndicate and the Roots Radics. Money and attacks on capitalism (specifically the World Bank) fuel Perry's ire on this disc, but just when the going gets heavy, Scratch pulls out a tribute to cartoon detective Inspector Gadget, as well as a great cover of Leroy Sibbles' "Party Time." As with their earlier release, Perry and Sherwood work well together, perhaps due to Sherwood's fondness for psychedelicizing his dub mixes and Perry's preference for flat-out weirdness. In any event, this collaboration between pupil and teacher is one of the better releases from this portion of Perry's long musical journey. By 1976, Lee "Scratch" Perry was well established at his Black Ark studio, a fact proven by the quality of the creations emerging from its walls. The success of Max Romeo's "War in a Babylon" brought a deal with Island Records and the possibility of greater financial rewards. The single was followed by a full-length album of the same name as well as deejay Jah Lion's Columbia Colly LP. Riding this crest of productivity, Scratch then turned to a creation of his own. 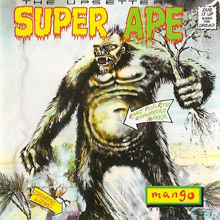 Super Ape offered a series of the producer's finest 1976 rhythms, from Devon Irons' "When Jah Come" and the Blue Bells' "Come Along" to Romeo's "War in a Babylon" and "Chase the Devil." All are bathed in the distinct, murky atmosphere that was becoming a Black Ark trademark, then served up in the form of dub-like de-constructions. Island's U.K./U.S. sequencing of Super Ape places "Dread Lion" at the album's heart. If any track fulfills the cover's promise to "Dub it up, blacker than dread", this is it. Vocals from numerous cuts seem to compete for their spot on the rhythm, while a dizzying mix of horns, flute and melodica swirl around them. Punctuating the song's rock-solid underbelly, Perry conjures startling thunderclaps from his mixing board. Other Super Ape heavyweights include "Croaking Lizard" and "Zion's Blood": thick muscular constructs from the Upsetter session team. The former features an excellent Prince Jazzbo toast over the "Chase the Devil" rhythm, while the latter, a cut of "When Jah Come," draws its elusive meaning from vocal phrases courtesy of Heptones Earl Morgan and Barry Llewellyn. Super Ape is a dubwise, alternate universe to Perry's Black Ark vocal hits. It awaits anyone willing to heed it's closing call: "This is the ape-man, trodding through creation, are you ready to step with I man?". It is said that this is Lee 'Scratch' Perry at the apex of his creative arc and it is hard to argue with such a bold statement. For any fan of the great man's work this is an essential collection on one double album. It includes some great bonus material and is the 'must have' dimiutive geniuses's record. This is a 13-song single CD that focuses exclusively on his Black Ark productions for Island in the 1970s. Perry's the artist of record on just three of the 13 tracks; the others include Perry productions of reggae stars Augustus Pablo, Junior Murvin, Max Romeo, and the Heptones, as well as more minor singers Keith Rowe, Devon Irons, and George Faith. If you're into Perry for the weirder and bolder aspects of his production, this might not be the best pit stop, since actually much of this is just top-notch reggae vocalists, with Perry adding a tinge of adventure from the producer's chair. Not that there's anything wrong with that, of course: Murvin's "Roots Train" is great high-pitched male reggae singing, the Heptones offer fine harmonizing on "Sufferers Time," and Rowe's "Groovy Situation" is just fine romantic '70s reggae (albeit with ghostly female laughter), period. The odder, more eccentric mixes of sounds and effects are heard in Perry's own tracks, particularly in the ethereal swirl of "Dread Lion" (one presumes that's Pablo's melodica in the mix), and the weird reverb-phase effects of Pablo's "Vibrate On." It's shameful that there are no recording dates or original release information for any of the tracks, but then that's something of a tradition for reggae reissues, even ones on major labels, such as this CD. This is a fantastic album, with great tracks from Lee Perry as a producer. Every track has its own atmosphere, every track has that unique reggae sound.